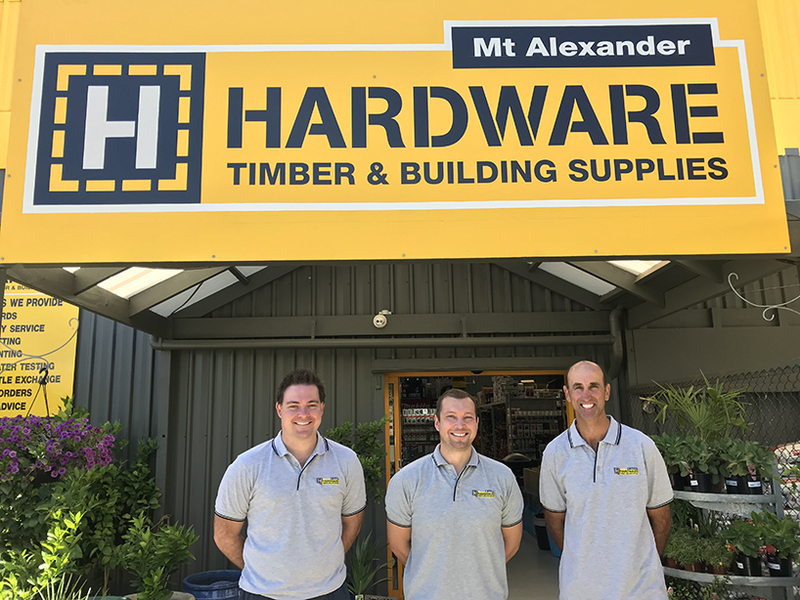 Three retail visionaries, Lachlan Maltby, Rodney Hickey and Trevor Butcher, purchased Mt Alexander Timber & Hardware, from the Beards family in December 2017. In just over 12 months of operation the store has achieved a 250 per cent increase in sales, and also in customer count, which the three attribute to a new store layout, investment in additional stock, and additional staffing. The nursery was expanded extensively during the refurbishments. Established in 1993, the store was originally opened by the Beards family, who were incredibly in the hardware game for approximately 70 years. When Rodney took over as the store’s new Managing Director, he had already operated a hardware store for over 15 years. Lachlan, on the other hand, is a Chartered Accountant, and has owned and operated the local accounting firm in Castlemaine (Smith & Maltby Accountants Pty. Ltd.) for over 10 years. Trevor owns and operates a building company as a registered builder, spending much of his time completing local property developments. 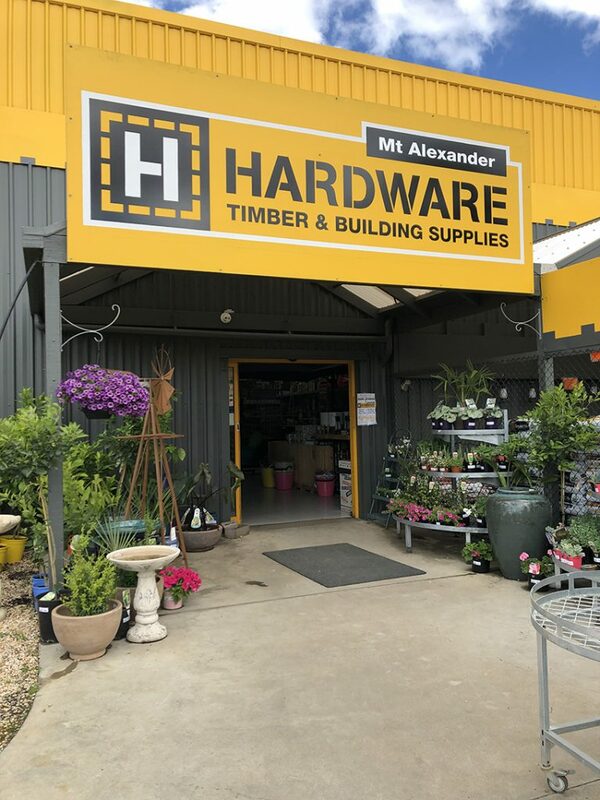 The three owners are understandably very proud of the success Mt Alexander Timber & Hardware has already achieved in just 12 months, which they attribute to having the ability to implement changes in-store, while ensuring minimal disruption to trading. Since first taking over the business, the store has undergone significant changes to bring the store into the 21st century, according to Rodney. “As we operate a seven-day a week business and refused to close for the refurbishments, we employed additional staff to complete many of the works outside of shop hours. This way there was minimal disruption to customers,” Rodney said. Just some of the refurbishments included the replacement of all racking in-store, with ‘supermarket’ style shelving installed to allow for a wider range and additional storage. The new racking was specifically designed to allow products to be highly visual to the customer, Rodney said. New cantilever racking in the timber yard allows for more depth of stock. 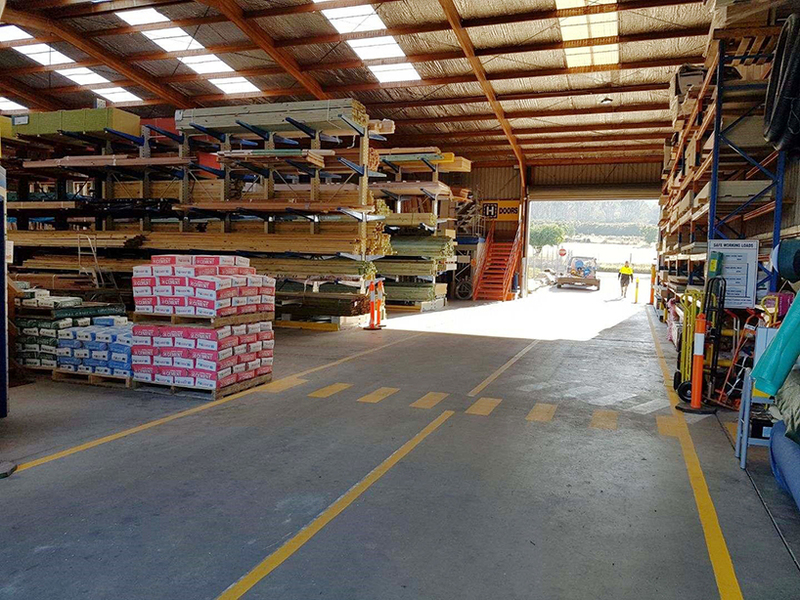 “We also replaced and added cantilever racking inside and out of our timber yard, to allow for additional stick ranges, as well as depth of stock,” he said. The store’s nursery was also expanded significantly during the refurbishments, to allow for more stock, with new racking installed. New lighting and new flooring was installed throughout the store, brightening the interior, while the store’s exterior also received a substantial facelift. 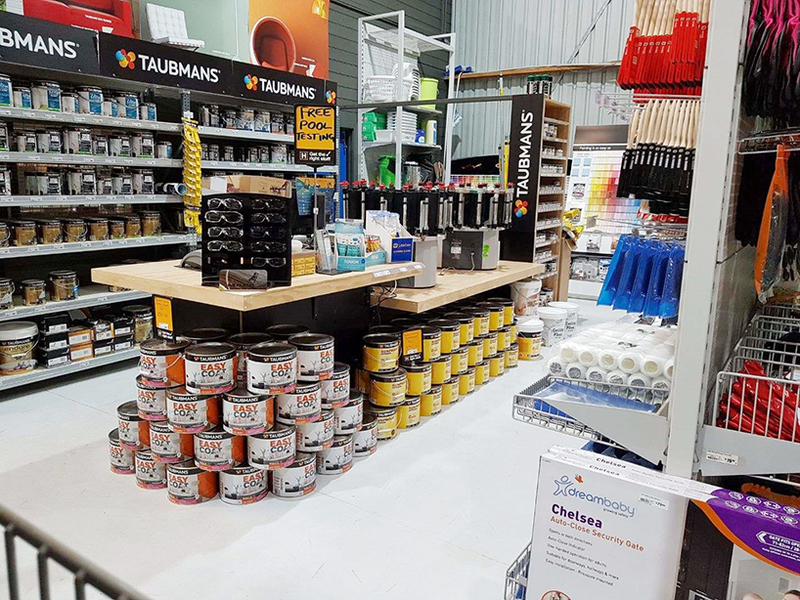 As part of the rebrand, new vibrant signage was installed throughout the store to assist customers in finding what they need, quickly and easily, particularly in the Garden, Paint and Plumbing departments. New racking was installed in the store’s paint department. “At the front end, we have centralised our point of sale system, while also installing new counters, topped with old bowling alleys. These changes were also implemented throughout the paint counter. Extensive OH&S assessments were applied throughout the business, with store standards adjusted accordingly,” Rodney said. “The business also purchased new equipment including a truck, ute and side loader, while also increasing its staff level by 25 per cent. We created a number of new positions in the business including a dedicated storeman, finance manager as well as additional delivery drivers to take on the new equipment. This level of demand was created by local builders, trades and businesses who continue to use us as their local, trade store,” he said. The three new owners also went on to purchase land adjacent to the existing building, to specifically allow more space to store bulk timber and reo. (L-R) Store owners Lachlan Maltby, Rodney Hickey and Trevor Butcher. 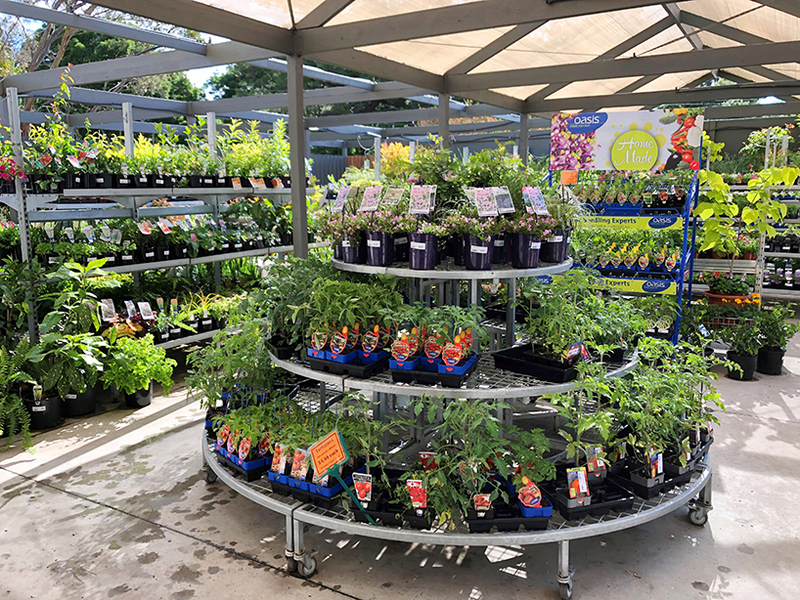 During the spring and summer months, the store’s nursery remains a large attraction for retail customers, while local tradesmen continue to visit the timber yard due to the range, supply and pricing being a big hit for trade. “Since the introduction of the higher quality range into our trade yard, our hardware section is always receiving positive feedback,” Rodney said. Now that all the changes have been implemented in and around the store, current stand out qualities of the business include the store priding itself on having stock available on request. “We continually implement superior customer service, exceptional product knowledge as well as ongoing competitive pricing throughout the store. Another stand out quality of the store includes being the only locally owned and operated timber and hardware store in the shire. Although we do compete against Ballarat and Bendigo stores, they are not necessarily local,” he said. Although the store boasts a split of 60 per cent retail and 40 per cent trade when looking at the store’s customer numbers, the business’s turnover sits at 80 per cent trade and 20 per cent retail. At 1,400 square metres, the stand-alone store is located just outside of town, next to a primary school and a bowling green. The store’s nursery is a huge draw card, particularly in the summer months. “The store could be potentially too far out of Castlemaine’s central business district, however, there is definitely more and more development happening on our side of town, which is on the increase. Being an hour and half north of Melbourne, we are fast becoming a tree change destination and commuter village often being referred to as ‘North Northcote’,” he said. When discussing why the three decided to join with HBT, Rodney said the freedom HBT offered to the store was the main draw card for the three owners, particularly as they were still able to choose their own suppliers and negotiate their own pricing. Although the trio definitely have plans in place to further grow and expand the store, at this stage they are careful not to reveal too many details. “We have just purchased more land at the rear of the existing property to allow for further expansion. We have also received planning approval to increase our car park at the front of the store. This will help ease traffic congestion and delivery issues on-site, while also giving us room to construct new warehousing for a number of new product lines. Without giving away too much, there will be some exciting new things in the pipe line,” Rodney said. “We have also engaged specific services that will survey our existing customers to determine exactly what products they wish to see added to the store and rectify any unknown service issues. We aim to continually develop our systems to keep in line with our current rate of growth. This is to ensure any growing pains are dealt with swiftly,” he said. All three owners said they owe the success of the last 12 months to their team of staff, and the local community for shopping local. It will be a bright future ahead for Mt Alexander Timber and Hardware.